Mohamed Ali Alabbar - Who is Mohamed Ali Alabbar? "Burj Dubai, the world's tallest building, will influence and inspire future generations of architects and engineers" said Mr Mohamed Ali Alabbar, Chairman of Emaar Properties. Who is Mohamed Ali Alabbar? 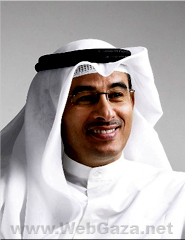 Mohamed Ali Alabbar, an Executive Director, is the founding member and Chairman of Emaar Properties PJSC since the company's inception on July 29, 1997. He is also Chairman of the Executive Committee and the Nomination Committee of the company. He is currently spearheading Emaar's high-profile global expansion and chairs John Laing Homes in the USA and Hamptons International in the UK as well as a joint venture with Italy's Giorgio Armani to set up a global luxury hotel and resort chain. Mr. Alabbar is also chairman of the Bahrain-based Al Salam Bank, the region's newest listed Islamic bank with operations across the MENA region. Mr. Alabbar serves on the board of directors of the Investment Corporation of Dubai (ICD), the investment arm of the Government of Dubai and the body responsible for managing the emirate's assets in the financial, transportation, industrial, energy, real estate and leisure sectors. He is also a Board Member of Noor Investment Group, an affiliate of Dubai Group, the leading diversified financial company of Dubai Holding, focused on Shari'ah compliant financial services. A sought-after speaker at international forums and on broadcast networks worldwide, Mohamed Ali Alabbar is an articulate spokesman for the region's economic renaissance – led by Dubai and firms such as Emaar Properties. In recognition of his vision and achievements, FDi magazine, published by the Financial Times Group, recently named Mr. Alabbar “Middle East Personality of the Year.” Arabian Business, the leading regional business magazine, ranked him second in its March 2007 list of the 100 Most Influential Arabs in the World. Fortune magazine in their issue of December 2007, has named Mr. Alabbar among the top 30 in power positions globally. A graduate in Finance and Business Administration from Seattle University in the United States, Mr. Alabbar works closely with regional NGOs, and is especially committed to the cause of educational reform. A keen sportsman, he is Chairman of the UAE Golf Association, and was recently named among the top golfing personalities in the world by Golf World. Mr. Alabbar was awarded an honorary doctoral degree in humanities from his alma mater, Seattle University, in recognition of his notable achievements in business, economic development and public service in Dubai and throughout the Middle East region.